Written with Carl Miller and Paul Leigh. 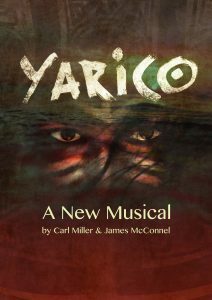 Set in the 18th century Caribbean, Yarico is based on the true story of a British sailor (Thomas Inkle) rescued from shipwreck by a native island girl, Yarico. The couple fall in love and ‘marry’, but on their way back to England, addictive gambler Inkle loses his wife in a shipboard dice game. Yarico is sold into slavery on the island of Barbados. This is the story of her escape and journey back to freedom. Yarico is currently in development for a further production.